An area separation wall is a component of townhouse construction, used where townhouse share a common wall. Building codes have special requirements for the walls separating adjacent townhome units, and the primary requirement is that they serve as two-hour firewalls–meaning that fire in one unit will require at least two hours before breaking through the wall. This allows ample time for evacuation and for firefighters to address the fire before the adjoining housing unit is compromised. There are many ways to meet the requirements for including foundation-to-roof masonry walls separating the units. An increasingly common and popular method is the gypsum area separation wall, which consists of individual stud-framed walls filled with fiberglass insulation for each housing unit, which are separated by a special construction that consists of steel studs, steel tracks, and two layers if 1-inch-thick gypsum liner panels held by aluminum clips. These separation walls are extra thick, with a double layer of gypsum drywall placed in the center. This type of area separation wall can be used in structures up to four stories (44 feet) in height, and it offers both fire resistance and sound attenuation between adjacent housing units. When properly constructed, a gypsum area separation wall serves to prevent a fire in one residential unit from breaching into an adjoining unit for at least 2 hours—which is enough time occupants to evacuate and for firefighters to successfully extinguish many fires. 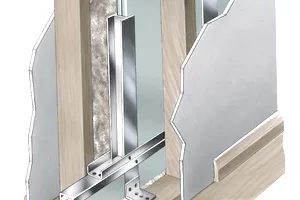 If a fire occurs in one area, the fire heat will melt the aluminum clips on that side, allowing the burning side wall to separate from the interior vertical fire barrier layer and collapse inward into the room. At the same time, the vertical fire barrier panel remains upright, supported by the aluminum clips on the opposite side of the wall, which have not been exposed to the fire. This system prevents the fire from migrating through the adjacent wall structure into the adjoining dwelling unit. The area separation component is added after the framing has been completed in one of the townhouse units and before the adjacent unit is framed. Normally a 2-inch thick firewall is assembled at least 3/4 of an inch away from the wood-stud or steel-stud framing. This allows space for fire-blocking product to be installed between the floor levels. The separation wall needs to be started at the foundation level and must go on all the way to the roof sheathing to form a parapet. The separation layer is normally constructed of two layers of 1-inch thick gypsum board (drywall), rather than the 3/8-inch or 1/2-inch drywall used for surface walls. The assembly is connected to the framing with aluminum clips that will allow the wall to collapse as fire exposure on one of the side affects the framing. This helps confine the fire to one side of the wall, and makes it less likely to to broach through the firewall and into the adjoining housing unit. The framed surface walls in both units are normally insulated with fiberglass batt insulation installed in the stud cavities to reduce sound transmission between the housing units. Be sure always to verify your building codes for additional requirements and specifications on how to build these walls, as they may vary depending on location. Faster installation when compared to regular masonry walls. Gypsum separation walls cannot be used where water and sunlight will have a direct impact on the panel. Openings are not allowed on gypsum separation walls. These walls are not intended to be used as shear walls. The system must avoid contact with materials having high moisture content. Exterior wind load is limited to 15 psf. must be installed after building has been properly closed.